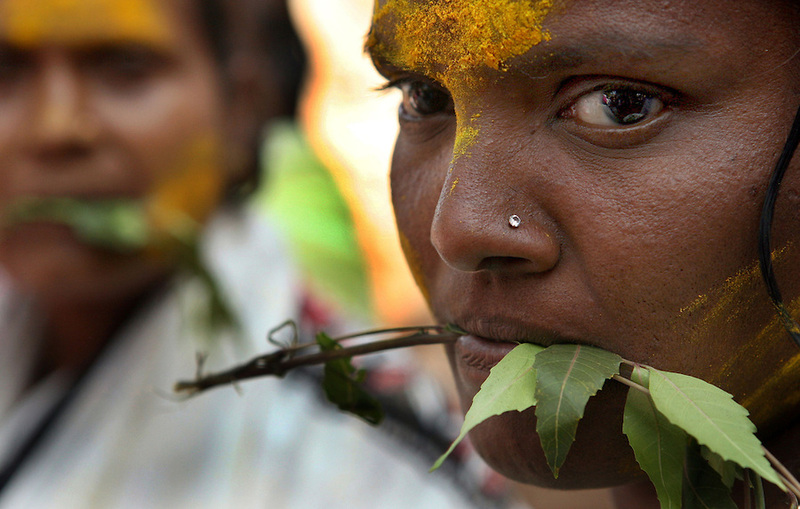 Yellamma worshippers hold neem leaves in their mouths as a gesture of devotion to the goddess, Yellamma, during the Yellamma Jatre (fesival) in Saundatti, India. This gesture harks back to the tradition of young girls being paraded naked except for neem leaves which were tied around their waists during their "marriage ceremony" to the deity, Yellamma. The practice is now outlawed but young girls from impoverished families continue to be "married" to the goddess Yellamma under the darkness of night or on the girls' home. Once they are married to Yellamma, they are regarded as servants to the goddess and must perfrom temple duties as well as satisfy the sexual needs of the priests and other men. They may no longer marry a mortal and often end up being sold by unscrupulous priests to pimps who take them to work in the red-light districts of India's urban areas.